POWERTEC's selection of enclosures - TENV, TEAO, DPFG and DPBV - provides suitable motor enclosures and mounting for virtually any industrial environment. The motors are available with NEMA foot mountings; NEMA C-face, and D-flange mountings are also available. These brushless DC motors use efficient ceramic ferrite permanent magnets bonded to the rotor to produce the magnetic field. Thus, there are no losses in the motor due to rotor induction currents. 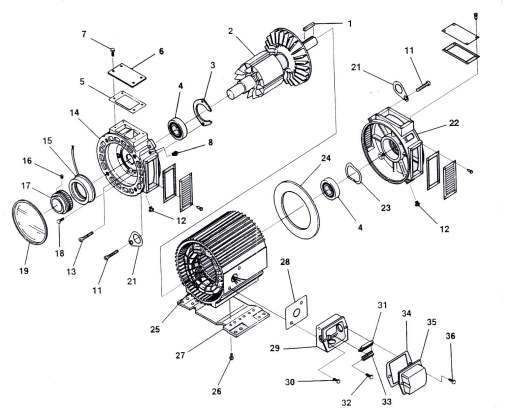 All of the current delivered to the brushless DC motor is used to develop torque. The powerful and lightweight permanent magnet rotor design provides low rotor inertia for high torque to inertia ratios in a relatively small frame. This high torque density equates to a very responsive motor with high starting and running torque, rapid start-stop capabilities and smooth operation over the entire speed range. The brushless DC motor is a true synchronous motor. The rotor field is always in sync with the excitation field; it does not have losses due to slip. This factor, inherent to brushless DC design, combined with various primary and secondary feedback options, allows for precise speed and torque control. Reliable, low-maintenance brushless DC motors do not have any brushes to replace or a commutator to wear out. Little heat is generated in the rotor allowing the bearings to run cooler while increasing bearing life. Factory mounted feedback devices are integral to the motor and eliminate high maintenance couplings. These motors are ideally suited for use in harsh industrial environments with unclean or particle saturated air. POWERTEC TENV motors offer high horsepower in a small frame size - from 0.25 HP in a NEMA 42 frame to 100 HP in a NEMA 320 frame. DPFG motors offer high horsepower in a small frame size - from 5 HP in a NEMA 180 frame to 300 HP in a NEMA 320 frame. The motor is cooled by integral fans mounted to the motor shaft. Air is drawn into and exhausted through finned plates in both ends of the motor enclosure. The larger rear fan incorporates a balanced, asymmetrical design. This design reduces audible resonance and causes turbulent airflow within the motor to eliminate hot spots. Our patented double finned aluminum frame allows more efficient cooling of the stator. TEAO motors provide high horsepower in a small frame size - from 10 HP in a NEMA 250 frame to 250 HP in a NEMA 320 frame. An aluminum shroud encloses a portion of the external finned aluminum motor housing. This design allows air to be moved over a large surface area of the motor for efficient cooling. This design also has the advantage of preventing dust particles from accumulating on the motor's surface, which act as an insulator and inhibit proper cooling of the motor. This enclosure permits cooling by an external blower. Our patented double finned aluminum frame allows more efficient cooling of the stator assembly. Air is exhausted through finned plates in the shaft end of the motor enclosure. These motors are protected from solid particles greater than 12 mm in diameter and liquids striking or entering the enclosure at an angle of not more than 15 degrees from the vertical (NEMA IP22). The motor is cooled in accordance with NEMA IC06. DPBV motors offer high horsepower in a small frame size - from 5 HP in a NEMA 180 frame to 300 HP in a NEMA 320 frame. This chart identifies the components of a typical model number code for a POWERTEC Ferrite NEMA 42 Frame. Contact your Powertec Industrial Motor Distributor for additional information and application assistance. This chart identifies the components of a typical model number code for a POWERTEC Ferrite NEMA 140 Frame. Contact your Powertec Industrial Motor Distributor for additional information and application assistance. Bearing selection may be application dependent. Refer to catalog for maximum shaft radial loading. Consult application engineering with special considerations. This chart identifies the components of a typical model number code for a POWERTEC Ferrite NEMA 180 Frame. Contact your Powertec Industrial Motor Distributor for additional information and application assistance. Terminal box top option not available with DPBV motor enclosures. See catalog for special options. This chart identifies the components of a typical model number code for a POWERTEC Ferrite NEMA 210 Frame. Contact your Powertec Industrial Motor Distributor for additional information and application assistance. This chart identifies the components of a typical model number code for a POWERTEC Ferrite NEMA 250 Frame. Contact your Powertec Industrial Motor Distributor for additional information and application assistance. * 3, 4, 8: Terminal block mounted in terminal box for motor power and MS Connector for feedback. 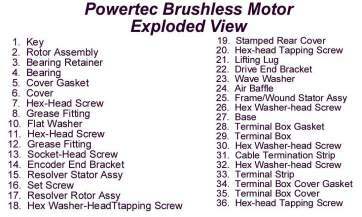 This chart identifies the components of a typical model number code for a POWERTEC Ferrite NEMA 280 Frame. Contact your Powertec Industrial Motor Distributor for additional information and application assistance. Brake option requires Primary Feedback Option 5. See catalog for special options. This chart identifies the components of a typical model number code for a POWERTEC Ferrite NEMA 320 Frame. Contact your Distributor for additional information and application assistance.